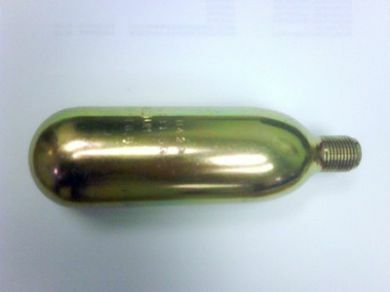 Our 95 cc helium cylinders measure a little over 5" long. Helium Cylinder, length 5", inner capacity 95.5 cc, thread 5/8-18, burst pressure 570 kgf/cm2, filling pressure 190 kgf/cm2, electroplating surface treatment . Length 5 3/16", width 1 10/16". Made by NTG Japan.